Tilghman is an island that’s about three miles long and separated from the mainland by Knapps Narrows. A drawbridge provides vehicle access to this island. Located 11 miles west of St. Michaels, Tilghman Island is on the Chesapeake Bay and Choptank River. Tilghman is known for its seafood, hospitality, and boating opportunities. The island boasts several marinas and excellent sport fishing. The best known of Tilghman’s fishing establishment is Harrison’s, located at Dogwood Harbor on the island’s eastern shore. Harrison’s operates a 14 boat charter fleet, 2 cruise boats, a country inn, and Harrison’s Chesapeake House, where seafood and prime rib are served family style. Chesapeake Bay Skipjacks: Tilghman Island is also home to the only commercial sailing feet in North America, the Chesapeake Bay skipjacks. Although there were once hundreds of these ships on the Bay, now there are only nine. The skipjacks are moored on Tilghman Island, in Dogwood Harbor, along with many other commercial fishing boats. The skipjack Rebecca T. Ruark, offer sailing tours from April to December, see reviews. You will find Dogwood Harbor and the skipjacks on your left, about a 1/2 mile after crossing the Knapps Narrows bridge. Lady Patty Sailing Charters offers sails aboard a canoe stern ketch that was constructed in 1931 in Solomon’s Island, Maryland. The Lady Patty is approved to carry up to 16 passengers. See reviews of Lady Patty sailing trips. Lazy Jack Inn on Dogwood Harbor – A waterfront home with great views. Walking distance to shops and restaurants. Wylder Hotel Tilghman Island – Small waterfront hotel (54 rooms) with restaurant and private marina. Formerly Harrison’s Chesapeake House. Remodeled and reopened in 2018 as Wylder Hotel Tilghman Island. Knapp’s Narrows Marina and Inn – Located adjacent to the Knapps Narrows bridge. Full service marina and 20 room waterfront inn with restaurant and tiki bar. Tilghman Island Inn – Waterfront inn with fine dining. 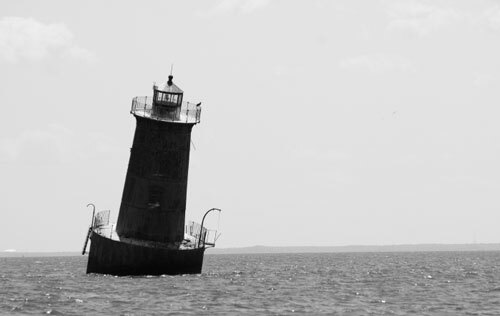 Sharps Island Light, located about 4 miles to the southwest, can be seen from the island’s southern tip. Chesapeake Lights offers lighthouse cruises aboard the M/V Sharp Island. They offer three different trips that vary in length and the number of lighthouses seen. Visit the Chesapeake Lights website for more information. The Phillips Wharf Environmental Center lets visitors get up close and personal with Chesapeake Bay critters. The Environmental Center, located at Phillips Wharf, Chicken Point Road, has touch tanks and information on the history of the Chesapeake Bay, from Captain John Smith to the present. The Tilghman Island Watermen’s Musem at the Lee House celebrates the work and culture of Tilghman’s watermen and their families. The museum features art and artifacts related to life on the island, including a collection of boat models, paintings and prints, and historic photographs. For a literary treat, visit Crawford’s Nautical Books in the Book Bank at 5782 Tilghman Island Road on Tilghman Island. The store features over 12,000 books on nautical, naval, and maritime subjects. They offer one of the largest selections on this topic on the East Coast and a visit to their shop should be of interest to anyone interested in boats and boating. Charter fishing boats are available to take visitors on sport fishing trips, or if you prefer to captain your own boat, motor boats, sailboats, jet skis, kayaks, canoes, and SUPs are available for rent at Tilghman Island Marina and kayaks and paddle boards can be rented from Knapps Narrows Marina. The popular Tilghman Island Day festival takes place in October of each year. The festival includes traditional eastern shore activities including crab picking and oyster shucking contests, boat rowing competition, boat docking contest. The festival also features live music, and lots of food (crab cakes, steamed crabs, barbeque, oysters and more) prepared and served by volunteers. All proceeds from the festival go to the Tilghman Island Volunteer Fire Department. Chesapeake Bay Skipjacks. Skipjack history and list of remaining ships. www.tilghmanisland.com Tilghman Island website, includes dining information. Talbot County Office of Tourism: The source Talbot Co. visitor information, including Oxford, Easton, St. Michaels, and Tilghman Island. The Skipjack H.M. Krantz An historic skipjack with daily charter departures from Tilghman Island and St. Michaels. The Skipjack Rebecca T. Ruark Sail onboard the oldest Chesapeake Bay skipjack. Talbot County Chamber of Commerce. Talbot County, Maryland Chamber of Commerce.